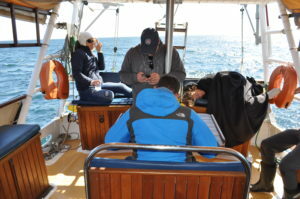 A good sail down the peninsula to round Cape Point, so we were hoping that for once the haul would be good and clean, no plastic. 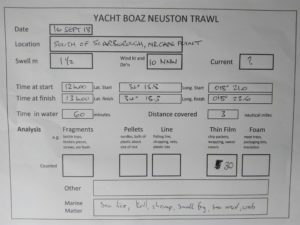 We deployed the Neuston trawl for one hour, about three miles, at 3 to 4 knots, under sail, so we gave the scoop an easy ride. We put the collection into this blue bowl, and at first glance all looked good, with just a few tiny fish and crabs visible. 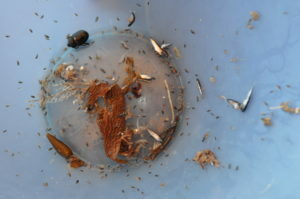 However, on closer inspection we counted 30 tiny bits of plastic. These were almost too small to see. What causes these small bits to be there? We were at least 6 miles from any housing on the shore. Spreading The Love: Music, Food & The Ocean. Madagascar: Waste Not- Want Not. First Trawl of the New Year! Fleur de Passion, The Incredible Journey. Copyright © 2018 Yacht Boaz. All rights reserved.